The mission of the Division of Health Policy & Management is to improve the public’s health by stimulating, coordinating, and conducting high-quality research and teaching programs that are focused on improving the organization, financing, and delivery of health care services — including preventive, remedial, and maintenance care. In addition, the division provides information and assistance to private and public decisionmakers, to help ensure optimal performance and coordination of activities in both the public and private sectors that affect the health of the public. We have a public health charter, and therefore focus on issues that affect both the efficiency and fairness of the distribution of all types of health care services (preventive, remedial, and maintenance) to populations. We are a university-based organization and embrace a philosophy consistent with an academic setting, including a commitment to rigorous, scholarly research, theory development and testing, intellectual integrity, peer review, and the creation of a stimulating and supportive environment for students and faculty. In keeping with our land grant charter, we are dedicated to the translation the knowledge generated from our research into practice to improve the health of the population, especially in Minnesota. Stimulate, coordinate, and conduct theoretical and applied research dealing with the organization, financing, and delivery of health services. Translate research findings into practice through technical assistance at the state and national levels, to prepare graduates at the master’s and doctoral degree levels for careers in health services research and policy analysis. Contribute to the broader teaching programs of the School of Public Health and the University of Minnesota by providing course work in health services research methods, health policy, and related areas. Further a coordinated research and teaching effort in health services research and policy. Read about the history of the Division of Health Policy & Management. Seven of our 30+ Health Policy & Management (HPM) faculty who are deeply involved in current policy-making and research. 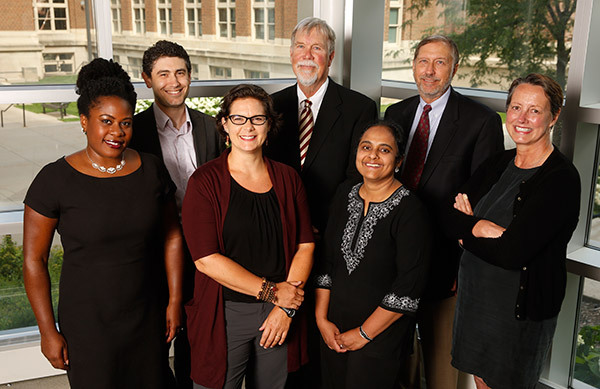 Pictured from left: Rachel Hardeman, Ezra Golberstein, Katy Kozhimannil, John Nyman, Sripriya Rajamani, Jon Christianson, and Rebecca Wurtz.